Four or five years ago, my good friend Jane and I decided to purchase compost tumblers on-line. We thought we could save a few dollars by assembling them ourselves rather than buy from a garden center. I liked the idea of having a modest size bin that I could turn by cranking the drum. Also I prefer the enclosed bins versus the piles, fewer critter problems. Jane and I were flabbergasted that the parts came in flat boxes. Once we digested that shock, we began our Lucy and Ethel “DIY” adventure. There were lots of items, so we laid them out and read over the directions and identified the various parts and connectors. We confidently began by assembling the frame and then the drum. Next we tried to put the two parts together but we discovered we had things backwards. Discovery can be painful, so we decided to correct our error and take it apart while we were familiar with the process. A two hour assembly ended up being 4 hours. We decided after that, to wait a few days for the second bin. We decided we were both visual people and the next one should go more smoothly, especially since we had the actual model right there to look at so we didn’t goof a second time. 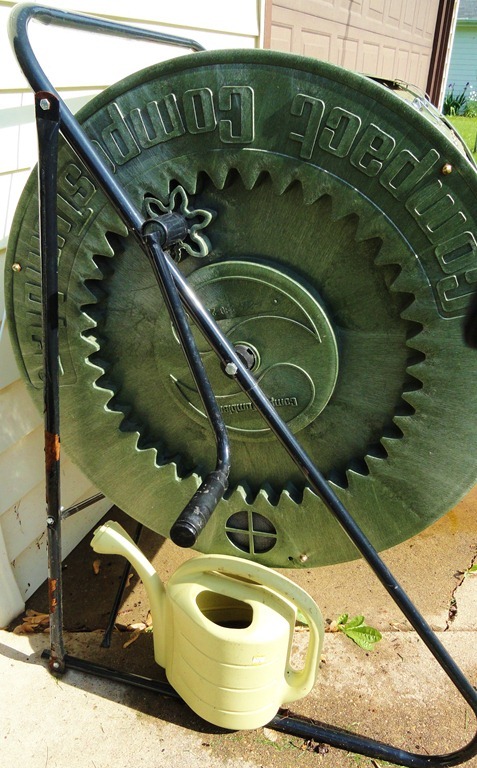 A week later we assembled the second composter and we were feeling like cocky Tim Taylor of “Tool Time” . We chuckled that we should go into business and sell assembled bins,now that we perfected putting them together in a couple of hours. We then quickly decided that would be too much work and abandoned our “get rich” scheme! Since assembly is a bit complicated, when I moved my bin to Wisconsin I did so without taking it apart. I have faithfully saved food scraps from fruit and vegetables, coffee grounds, green yard waste, plant cuttings and bloom “pinchings” and pop them into the tumbler. I give the bin 6 full cranks most days. 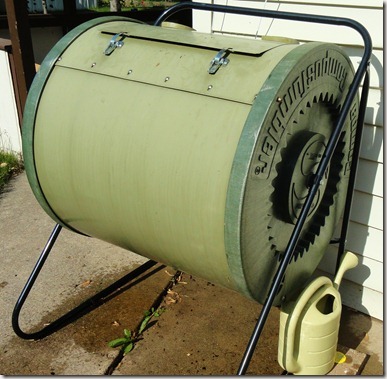 I keep the composter positioned so that it gets a good eight hours of full sun so the wet contents can cook in the sun. In a few months I have a nice batch of compost. I could hurry things along a little faster, by using additives that speed up decomposition, but I am in no hurry, so I don’t use those. 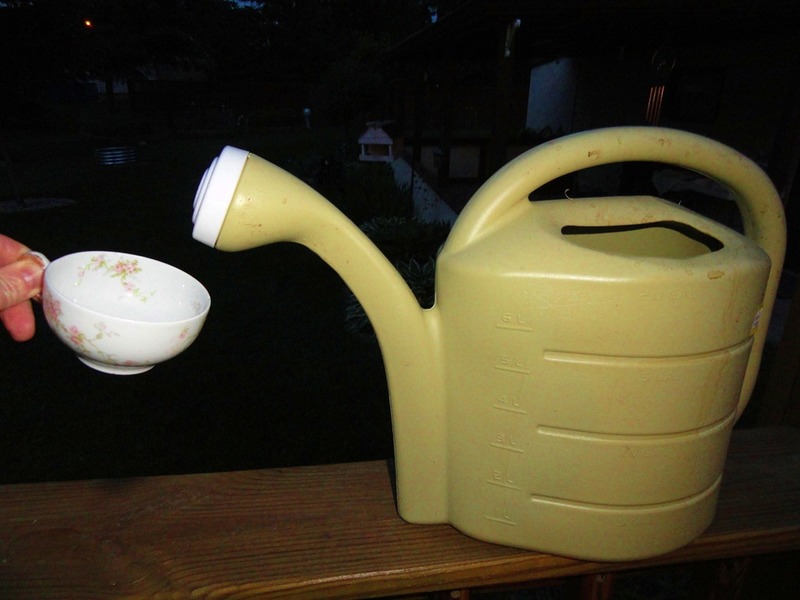 Something else I have discovered that there is a very useful “green”, well actually brown, by-product: compost tea. I add a few gallons of water to the bin, I keep it at an angle so the liquid can’t come out. Letting it sit and steep for a week, creates a nice batch tea. 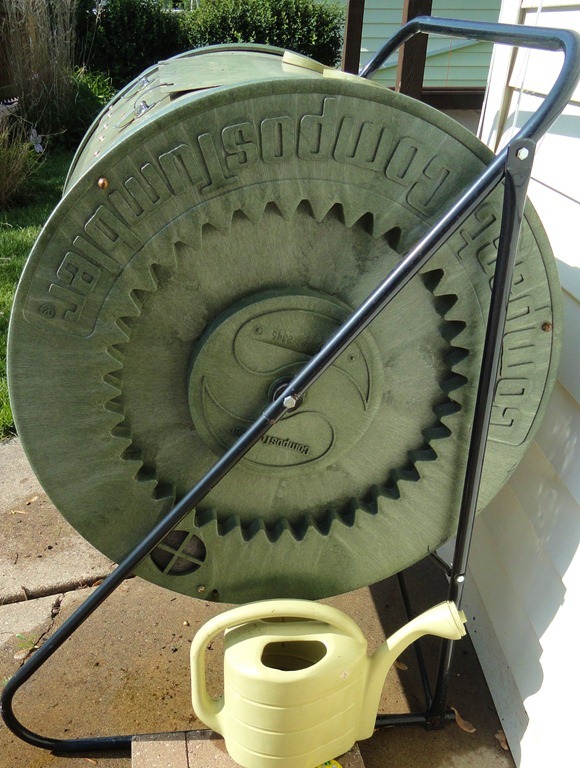 I then, roll the drum so that the brownish liquid can drain right into my garden sprinkling can and another bucket. If you don’t use a bin, but instead a compost pile, just add a few shovels full of compost into a net bag and letting the bag soak in a bucket of water for a week. I like my method because it just “pours” out of the bin side screens, a very efficient process without any extra straining needed. So what is all the fuss about compost tea? Well there are several benefits. It is a staple of organic gardening and is totally “green” when used as a liquid fertilizer and a disease preventer. It is said to suppress disease to the foliage of plants (if sprayed directly on the plant in the early spring), and it increases the amount of nutrients available to the plant. I am not an organic gardener, but there are a few practices that I like. I read that it is good to water the soil of new transplants with compost tea to give them a healthy and natural “kick start”. There is a down side. Caution should be observed when handling this liquid since it contains both good and bad (to humans) bacteria. So waterproof garden gloves are a good idea and make sure you have good hygiene after using it. So don’t go into the kitchen a starting making lunch without washing up well or it could be your last lunch. A disclaimer is I am not a compost or compost tea expert. There is a deep scientific explanations to what is happening during decomposition, but I am choosing to keeping it simple. So…one lump or two with your compost tea?